The sandstone at footpath level is massive, flat bedded and has prominent vertical jointing in two directions. The cross bedded sandstone lies above the massive sandstone. 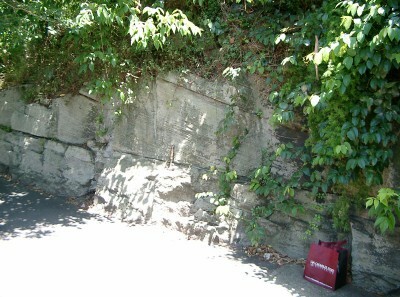 The rock exposed on the northern side of the street is the Hawkesbury Sandstone. It is of Middle Triassic age (approx 235 million years before the present) and is characterised by cross bedding. The cross beds generally dip to the NE (downhill, towards Blackwattle Bay), indicating a sediment source to the present SW. Walk down hill to the end of Cook Street and seawall of the bay. Note that the oyster covered blocks in the water are concrete. Walk north along foreshore, noting use of local stone in the seawall and paved areas. Branagan, D & Packham, G, 2000. Field geology of New South Wales, 3rd edition. New South Wales Department of Mineral Resources, Sydney.